The lining epithelium of the parabronchus and the atria is a simple squamous tot cuboidal epithelium. The atria are separated from each other by interatrial septa (septa interatrialia). On top of these septa, thick bundles of smooth muscle bulge into the parabronchial lumen, forming the atrial muscles (mm. atriales). In galliform species, these mm. atriales and the connective tissue of the septa interatrialia, as well as the interparabronchial septa are well developed. In good flyers such as pigeons, the septa are strongly reduced or can even be absent. 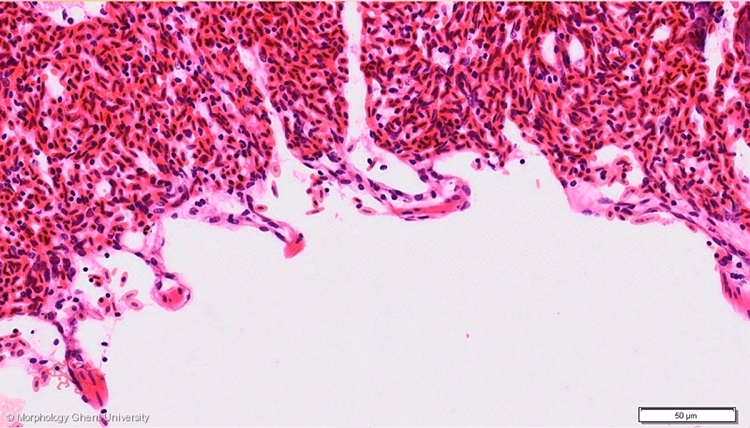 The micrograph above shows a non-bled lung. The red blood cells are so numerous that deeper lying structures are difficult to recognize.